Gee Whizz, Touch & Go is now Ouch & Gone! Attentive followers of iceboat.me will remember Frank Able’s purchase of the old B Skeeter Touch & Go with the idea to use her gear in the building of a new Whizz. 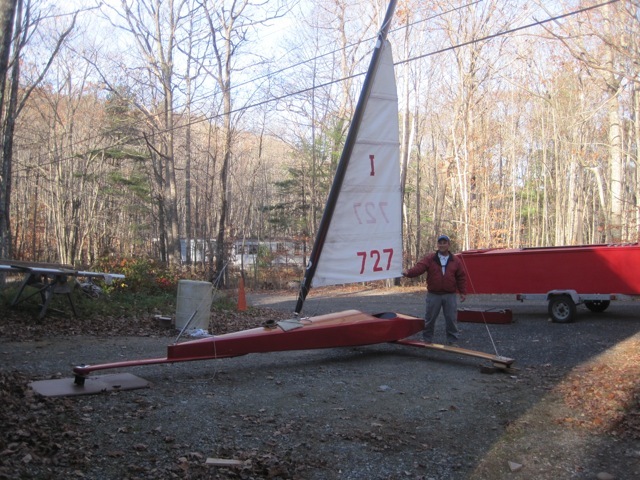 Bill Buchholz built the boat for him from a hull started by Steve Lamb; cutting down the old sail as a storm sail and commissioning a Whizz class sail from Henry Bossett. All that’s left to do is the name on the side, Gee Whizz, and a seat cushion and then wait for Sweet Miss Plymouth. Meanwhile, Bill was left with the old fuselage. It is a beauty, built in 1960 by Chris Smith of Chris-Craft fame. The quality of the spruce and some of the details attest to this lineage. In spite of pressure from the CIBC Peanut Gallery, it was not going to be restored as a B Skeeter. Cody Sisson had already been down that road. 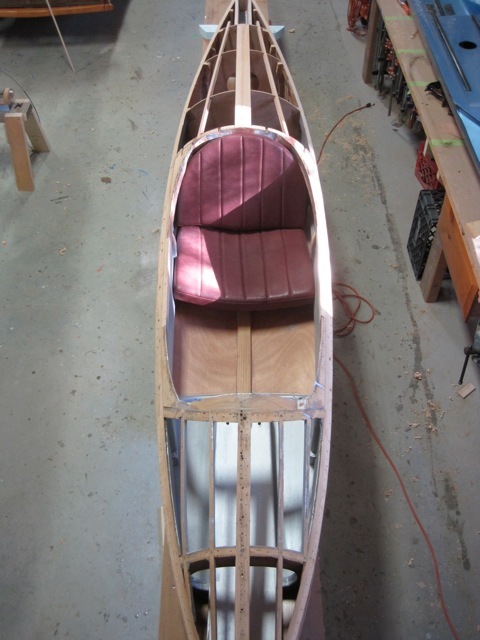 But Cody’s latest front seat C Skeeter Raven, and Tom Nichols similar project set the wheels spinning. Bill kept noticing Touch & Go’s lovely stern and thought what an awesome bow it would make. So Touch became Ouch and the long skinny bow was Gone. The cockpit was reversed and lengthened, the bulkheads ripped out, side boards pulled in with a new sheer line struck, and new bulkheads and mast step installed. 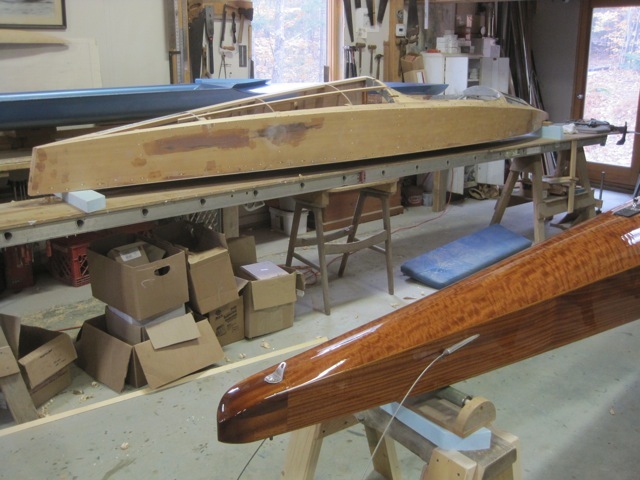 The spring board is internal, and she has a 16′ airfoil section runner plank. There is the beginnings of an 8″ carbon mast, and the rest of the gear is in the shop. We hope to see her on the ice this season. Of course, we will definitely see her sailing if a buyer steps forward! Lastly, just a note to report that the Maine Maritime Museum in Bath is running an iceboat exhibit this winter. The little stern steerer Islesboro Express is set up inside, along with the Monotype XV Fast Piece of Furniture. Lots of photos and a few videos round out the show. Denis writes that it’s getting colder in Quebec. Forty degrees and rain here. This entry was posted in Whizz. Bookmark the permalink.